NEW CAR SALES in Ireland have jumped by 24% in the first six months of the year, with almost 66,000 vehicles sold so far in 2014. Industry website motorcheck.ie said that if the trend continues to the end of the year new car sales could clear 90,000 for the year. The increase is largely being driven by positive consumer sentiment returning to the economy in the latter stages of last year, with many buyers deciding to go ahead with purchases that they had been putting off during the recession. Data from the CSO shows that the auto trade has been among the strongest performing sectors in the economy, with spending on cars a main driver of resurgent retail spending so far this year. 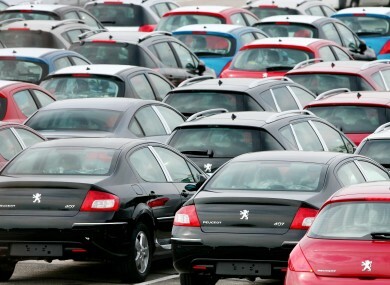 Motorcheck.ie managing director Michael Rochford said that the market is also being helped by trade-in and vendor finance offers currently being pushed by major manufacturers. He said that around 26% of new vehicle purchases are completed with the aid of some sort of vendor finance. The top selling brands in Ireland so far this year are Volkswagen, Toyota, Ford and Hyundai, with the VW Golf, Nissan Quashqai, Ford Focus and Toyota Corrolla the most popular models. Businesses are also re-investing in commercial fleets, with a 43% increase in units shifted during the first half of 2014, with the Ford Transit, Volkswagen Caddy, Citroen Berlingo and Land Rover discovery leading the pack in sales. Could you afford to buy a new car this year? Email “How many new cars have been sold in Ireland so far this year?”. Feedback on “How many new cars have been sold in Ireland so far this year?”.